Facing only three over the minimum Friday night, Adam Wainwright cruised through the Brewers’ order in an 8-0 win for his first complete game in 98 major league starts. Wainwright needed just 103 pitches as he struck out eight Brewers and gave up only two hits, none after the second inning. Offensive highlights, Colby Rasmus hit a two-run blast in the sixth inning, and Matt Holliday doubled home Ryan Ludwick in the seventh. 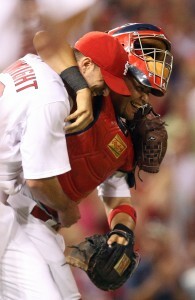 Ludwick doubled home two runs in the eighth inning for the Cardinals, and Albert Pujols added an RBI single.